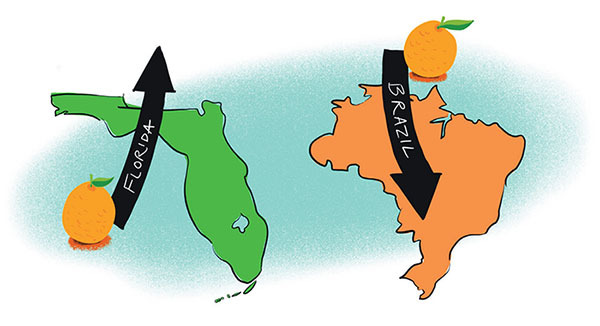 When compared to last season’s output, expected orange production this season is dramatically different in both Florida and Brazil. The U.S. Department of Agriculture’s November forecast for Florida’s 2018–19 orange crop is 77 million boxes, 71 percent more than last season’s 45 million boxes. Of these 77 million boxes of oranges, 32 million boxes are non-Valencia varieties, while 45 million boxes are Valencias. Positive weather conditions — including a warm, wet summer and no hurricanes — and good maturation helped this recovery. Although there are still some risks ahead, the situation is much better than last season. This recovery is very important to reduce the idle capacity of the orange juice chain (from crop inputs to processing and management). Creating more efficiency and producing more not-from-concentrate juice will help to avoid further price increases that damage consumption. In Brazil, the second estimate of the citrus season by Fundecitrus reduced the size of the 2018–19 orange crop by 5.2 percent. It now stands at 273.3 million boxes with 34 percent of the crop harvested. Unlike in the United States, Brazil’s weather was not as cooperative. A very dry winter hit the orchards. From the first estimate, we’ve already lost approximately 15 million boxes. Due to a very humid 2017, citrus greening incidence in Brazil is up 8 percent. The disease now reaches 35 million of the Citrus Belt’s 175.27 million trees. An infection rate of 18 percent is the index in Brazil. Citrus area has dropped from 430,000 to 400,000 hectares since 2015. The number of farms has declined from approximately 7,600 to 5,900. More technology and irrigation (30 percent) are increasing yields (762 boxes/hectare for 2018–19, compared to 550 boxes/hectare in 2000). However, these gains come with much higher production costs. Structural changes in Brazil were motivated by good prices in recent years. On the supply side, there will be a much larger crop in Florida this season. At the same time, a much smaller crop is expected in Brazil (almost 400 million boxes were produced in 2017–18). On the consumption side, from 2016 to 2017, worldwide orange juice intake fell nearly 4 percent, going from 1,956,000 to 1,882,000 tons. Higher supermarket prices in the United States (2.6 percent more expensive) and smaller packages (Tropicana and Minute Maid reduced size from 59 to 52 ounces) affected demand. Demand decreased 5.1 percent in the four weeks of September 2018 compared to the same time period in 2017. Since the beginning of the season, demand has dropped 4.8 percent. Consumption was one of the most relevant debates at the European Fruit Juice Association’s Juice Summit held in October in Antwerp, Belgium, where I had a chance to speak. As for orange juice inventories, based on Brazil’s original estimate of the season, Citrus BR expected approximately 146,000 tons at the end of June 2019, with internal fresh-market consumption of 40 million boxes and a yield of 258 boxes per ton of frozen concentrated orange juice. Now, the smaller crop may reduce these numbers. So even with the consumption decline, the stock situation still needs further increases in production. Brazil is seeing good bloom for the 2019–20 crop, since rains in September and October were favorable and very high temperatures did not occur. Climate risks should always be considered, so weather conditions in both Florida and São Paulo are the major variables to currently follow.